Many things divide us in the world today, but there’s one thing which we can all agree – dogs are adorable, and precious, and help to make life worth living. 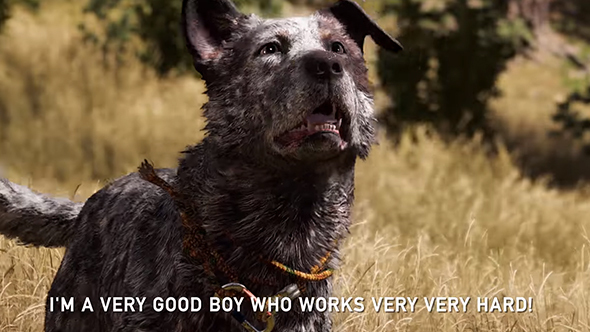 Far Cry 5’s resident pooch, Boomer, is no exception, and he’s here to explain why he’s the very best helper character in the game. Looking for more details? Here’s everything we know about Far Cry 5. I have to say, Boomer makes some good arguments. “I’m a very good boy who works very very hard! Bad people killed my family, so I will take down the bad people!” Compelling arguments so far. “I jump on the bad ones, I bite the bad ones!” This is solid so far, Boomer, but- “Please pet me sometimes. We’re family now!” Alright, buddy, now I realize there was never really a choice. All of Far Cry 5’s guns for hire are making their case in a new set of trailers (US version above, UK version here) running down their backgrounds and abilities. Boomer can tag nearby enemies and has a chance to fetch their gun after taking one down. Nick Rye is family man who’ll attack the enemy with bombs or strafing runs. Jess Black is a stealth specialist who can evade detection from enemies both human and animal. Then there’s Hurk Drubman Jr, an explosives-obsessed redneck who wields a heat seeking rocket launcher. Adelaide Drubman is another pilot who can deliver custom choppers for you. Sharky Boshaw is a self-described pyromaniac who’ll fight with incendiary rounds and is resistant to most explosions himself. Finally, veteran Grace Armstrong is a sharpshooter who can set enemies fleeing in terror with a single shot. Far Cry 5 is due out on March 27. Based on our early hands-on time with the game, it’s one that shines brightest in co-op.